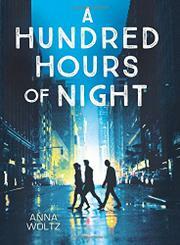 A Dutch teen flees scandal at home for the bright lights of New York only to encounter Hurricane Sandy. Fifteen-year-old, anxiety-ridden Emilia de Wit steals her father’s credit card and books a flight to New York City as well as a room through Craigslist after the news goes viral that her principal father has fallen in love with a student. No surprise, the room is a scam, and Emilia has no place to stay while Sandy approaches. Desperate, she throws herself on the mercy of Seth, the teen boy who actually lives in the Craigslist apartment. Together with Seth, his little sister, Abby, and “movie-star” beautiful Jim, a down-on-his luck 17-year-old from Detroit, they hunker down to wait out the storm and together find a strange kind of magic in the darkened streets of lower Manhattan when the lights go out. The fairy-tale version of New York is ridiculous (Emilia’s actions are dangerous yet everything repeatedly has a happy outcome) but also a love letter to a city that shines when the chips are down. The way Emilia, Seth, Abby, and Jim (all white) help each other deal with various issues (all emotional) and the way her adventure cures Emilia’s germ-focused OCD–like tendencies are sweet and simplified, as is the blossoming romance between Seth and Emilia.